Jennifer Lawrence is the cover star for Vogue USA's new September 2013 issue! Included in her HUGE feature are photos and interview snippets, discussing Catching Fire as well as lots of other things. 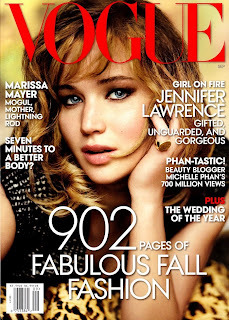 An interviewer from Vogue spent 7 HOURS talking with Jennifer! Check out BTS and interview videos, photos and interview snippets below, or head over to Vogue for the full article. "One of the oddities of Jennifer Lawrence’s life right now is that the character that she is most closely associated with— Katniss Everdeen from The Hunger Games—is on a trajectory that is, in many ways, similar to Lawrence’s own. “When Winter’s Bone was getting nominated,” says Lawrence, “I had only done indies, and suddenly I was introduced to this brand-new world where I didn’t feel like myself. I was in these weird gowns and listening to people talk about things I didn’t understand. And I remember reading that in the book and being like, Oh, my God, I know exactly what this feels like. I don’t know what it’s like to get ready for your death, but I do know what it’s like to be almost a puppet. And then when I was making the second film, I had become more acquainted with that world, and I think that’s something that Katniss experiences. She is different when she comes back. She does feel more comfortable in the Capitol; she understands the people more, and it’s not as eerie and scary and unfamiliar. She kind of knows how to work the system.”"
Jennifer also celebrated her 23rd birthday on August 15th, so a belated happy birthday! The magazine will hit newsstands on August 22nd. Buy it!